Since 1903 the Scottville Clown Band has delighted audiences statewide! They're back! 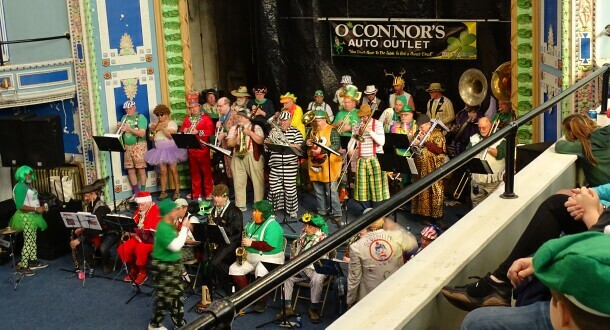 One of the treats from last year's Saint Patrick's Parade was the Scottville Clown Band. Playing since 1903, this great band has performed all over the state. They had so much fun last year, and the reception in Bay City was so great, they just have to come back. A committee member quoted a band member as saying "We thought it was just your typical little, local parade. We had no idea how big this Bay City tradition actually is!" So watch for the band in the parade, but when it's over, DON'T LEAVE TOO SOON! Why? Because, just in case you don't get enough during the parade, the band will follow up with a FREE CONCERT at Historic Masonic Temple after the parade! Each year the band gives four FREE CONCERTS to raise money for good causes. For the second year in a row, they chose the Historic Masonic Temple in downtown Bay City as a location for one of these concerts. and will march in the annual St. Pat's Parade. Not only is the concert free to the audience, but it's also put on without cost to the organization the band is honoring. In this case, the Friends Of The Historic Masonic Temple of Bay City will benefit. There will be concessions and drinks sold and all the proceeds will go to the Friend's coffers and put back into the restoration and preservation of the historic temple. The plan is for the band to bring up the end of the parade. When they get to the corner of Center and Madison they'll hook a left and march the half block to the big red Masonic Temple. Everyone who follows them will be treated to the free concert in the great "Blue Room". If you're one of those people who has never been inside the historic temple, this is your chance. The building has been lovingly maintained and, although there are certain things that need to be done, the place is a real gem and well worth the visit. The story of the band is rich in history and goodwill. We'd tell it all here, but we think you should really just go to their website and see what it's all about. Just click on www.scottvilleclownband.com and enjoy the story. There are also a lot of YouTube videos of the band (including the one below). Just search for Scottville Clown Band. For more information about the Temple and its "Friends", visit their Facebook page www.facebook.com/FriendsOfTheMasonicTemple. Images from the Friend's Facebook page.